This term is also called an Alt tag and Alt attributes. It means alternative text, inserted into HTML code with the purpose of describing an image on the page. How to write an Alt text? Don't use "picture of" and "image of"
How to write an Alt text for SEO? Alt text in email marketing is extremely important. If you send bulk emails to thousands of recipients, be ready that many of them won't see the images. Email clients mostly block images because of privacy issues. So, you should find the ways to avoid poor user experience. Alt text can't fully substitute an image but at least it's much better than an empty image icon. This is the primary function of an Alt text. People can block images for better speed, or it may even be a default setting of an email client. In this case, an Alt text is displayed instead of an image. If there is no Alt text, there will be just an empty icon. This is the way your subscribers will see a blocked image with an Alt text. You should think about your subscribers with special needs. People with vision impairment use screen readers. They are able to interpret an Alt text. Otherwise, users will fail to understand what is described in the image. Besides, don't use the image title instead of an Alt text. Despite the fact that it doesn't fully describe the picture, titles are often only a mix of letters and digits. Just imagine the confusion felt by people when their screen reader reproduces this. As 2 primary functions of an Alt text is to substitute images that do not render and satisfy the needs of people with vision impairment, you should describe the image in details as much as it is possible. To check whether you succeeded or not, ask your friend to close his eyes, read him an Alt text and ask if he could imagine this image. If yes — congrats! It is not descriptive enough. 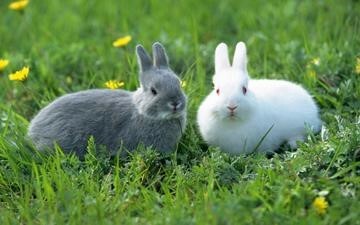 Perfect Alt text — Grey and white rabbits are lying in the grass. Despite the fact that it should be highly descriptive, mind screen readers. They cut off an Alt text which contains more than 125 characters. So, follow this restriction or make it even shorter. It is obvious that your Alt text refers to an image. If you include these words into an Alt text, a screen reader will reproduce "Image Image of". If you add an image which is at the same time a button, make sure that an Alt text explains where it leads. Use the same words as a button contains. Very often there is a logo of your company at the top of an email, clicking which a user will be redirected to your homepage. This is considered to be a normal practice. In this case, there's no need to write "Logo" in the Alt text as it has no relevant information. Just write your company's name. Probably you want to make your email more beautiful and nice to look at with the help of a decorative image. This type of images doesn't introduce any message. Thus, don't write an Alt text for them. They should have null alt text. (alt=""). Sometimes, if an image is very big, it's sliced into multiple images because of design issues. In this case, all the sliced images convey the same idea, but don't write an Alt text for each of them. Choose the largest image and write an Alt text for it, because it has more space. Alt text helps the search engines to comprehend the images on the web pages while crawling. The page is ranked higher if there is an Alt text to the images, besides it influences greatly the image search. If your images have Alt text, it's very likely that they will be displayed in the image search — they are very helpful for search engines. If possible, include keywords in your Alt text, but only if they correspond to the sense of an image. Otherwise, keywords stuffing will do harm. Presence of keywords in the Alt text is great, it shows the relevance of the page, but it's not always possible. Don't stuff your Alt text with keywords if they don't help to describe an image because it will only harm you. Search engines don't like such practices. To see the Alt text, hover a cursor over the image. Follow these tips for great user experience! Also searched with "Alt text"
Rate this article about "Alt text"
If you are interested in "Alt text" you might be interested in our bulk email service.